Lack of adherence often results from polypharmacy, fear of adverse effects, misunderstanding the importance of the medication, lack of symptoms, or confusion about treatment duration.2 Fortunately, some patient services exist to successfully reduce these barriers. Polypharmacy is defined as taking multiple medications concurrently to treat 1 or more conditions. Some experts describe it as a certain number of prescriptions (eg, 5 or more), but most agree that it is better defined as the presence of medications that are unnecessary or lacking indications.3 Many patients find multiple medications difficult to manage, leading to missed doses. Vincent Bucchieri, PharmD, of New Haven Pharmacy, in Connecticut, offers pre-poured, individualized blister cards or pill boxes. Each pack contains a 1-month supply of a single medication. The numbered packs hold 1 pill per blister, and patients punch the foil to obtain their daily dose. If patients can’t remember whether they took their medication, punctured foil confirms that they did. Patients can also see clearly when it is time for a refill, rather than guessing how many pills remain at the bottom of traditional vials. This encourages timely refills and decreases the chance of delays related to stock outages. Blister cards can be bulky and difficult to coordinate for patients taking 10 or more medications. For them, pill boxes containing 4 compartments (morning, noon, evening, and night) for each day are more convenient. Pharmacists organize specific patients’ medications into the boxes. If new drugs are added midmonth, patients bring their pill boxes to the pharmacy for adjustments. Many community pharmacies are exploring medication synchronization as another option to improve adherence. This strategy aims to coordinate a patient’s refills so that all fall on the same day every month. Many retail pharmacies are implementing systems that identify patients who have uncoordinated refill dates. The system calculates short-term or partial fills for prescriptions that are out of sync; later, the patient refills all the prescriptions together. This process can be repeated when new medications are added to the regimen (table 14). MTM software and documentation vary from pharmacy to pharmacy, though the process is usually similar. Edward Schreiner, RPh, of Stoll’s Pharmacy in Waterbury, Connecticut, uses a program called Mirixa. The system chooses 2 or 3 patients who would benefit from MTM services (table 28) and are eligible for the service based on their Medicare 5-star rating each week. Once a patient has been flagged, Mirixa prompts the pharmacist to schedule an interview to review medications and medical status. The pharmacist creates a comprehensive list of medications that the patient takes and addresses questions, concerns, and knowledge gaps. After gathering information, the pharmacist assesses the case and documents recommendations and counseling points. “The best part of the program is that it prompts the pharmacist to send a copy of this documentation home, minus the medical jargon, for the patient,” Schreiner says. 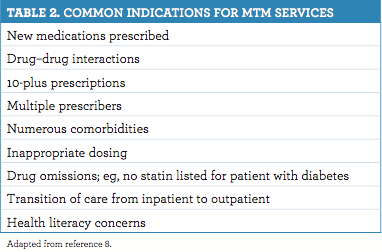 “It also faxes a detailed copy of our recommendations to the patient’s doctor.” MTM services eliminate more adherence barriers. Ms. Haskins is a 2018 PharmD candidate at the University of Connecticut. 1. Iuga A, McGuire MJ. Adherence and health care costs. Risk Manag Healthc Policy. 2014;7:35-44. doi: 10.2147/RMHP.S19801. 2. Wolinsky FD, Hall SF, Edmonds SW, et al. Patient-reported reasons for nonadherence to recommended osteoporosis pharmacotherapy. J Am Pharm Assoc. 2017;57(4):503-509. doi: 10.1016/j.japh.2017.05.003. 3. Bushardt RL, Massey EB, Simpson TW, Ariail JC, Simpson KN. Polypharmacy: misleading, but manageable. Clin Interv Aging. 2008;3(2):383-389. 4. Krumme AA, Isaman DL, Stolpe SF, et al. Prevalence, effectiveness, and characteristics of pharmacy-based medication synchronization programs. Am J Manag Care. 2016;22(3):179-186. 5. Doshi, JA, Lim R, Li P, et al. 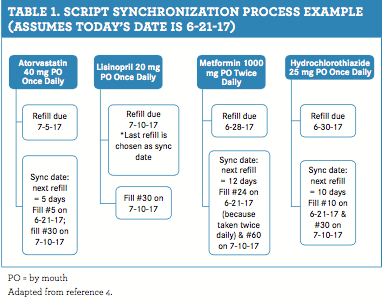 A synchronized prescription refill program improved medication adherence. Health Aff. 2016;35(8):1504-12. doi: 10.1377/hlthaff.2015.1456. 6. Ponte ML, Wachs L, Wachs A, Serra HA. Prescribing cascade. A proposed new way to evaluate it. Medicina (B Aires). 2017;77(1):13-16. 7. American Pharmacists Association, National Association of Chain Drug Stores Foundation. Medication therapy management in pharmacy practice: core elements of an MTM service model (version 2.0). J Am Pharm Assoc. 2008;48(3):341-353. doi: 10.1331/JAPhA.2008.08514. 8. Ramalho de Oliveira D, Brummel AR, Miller DB. Medication therapy management: 10 years of experience in a large integrated health care system. J Manag Care Pharm. 2010;16(3):185-195. doi: 10.18553/jmcp.2010.16.3.185. 9. Bodenheimer T, Fernandez A. High and rising health care costs. Part 4: Can costs be controlled while preserving quality? Ann Intern Med. 2005;143(1):26-31. 10. Kymes SM, Pierce RL, Girdish C, Matlin OS, Brennan T, Shrank WH. Association among change in medical costs, level of comorbidity, and change in adherence behavior. Am J Manag Care. 2016;22(8):e295-301. Are Smart Bottles the Solution to Medication Non-Adherence?